About "Angle relationships in parallel lines and triangles worksheet"
Worksheet given in this section is much useful to the students who would like to practice problems on parallel lines cut by a transversal and triangles. 1. In the figure given below, let the lines l₁ and l₂ be parallel and m is transversal. 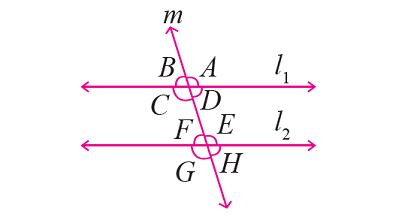 If ∠F = 65°, find the measure of each of the remaining angles. 2. Can 30°, 60° and 90° be the angles of a triangle ? After having gone through the stuff given above, we hope that the students would have understood "Angle relationships in parallel lines and triangles worksheet". Apart from the stuff given on "Angle relationships in parallel lines and triangles worksheet", if you need any other stuff in math, please use our google custom search here.